In the past couple months, it's become abundantly clear that today's teens are tenacious and enterprising. Add in the fact that they are "digital natives" and have a firm grasp on social media and technology, and it seems as if there is very little teens cannot do if they put their minds to it. Unfortunately, there is one area where teens feel a little less optimistic: Money. According a 2013 survey by Junior Achievement, an organization dedicated to teaching kids about money, 25 percent of teens believe they will not be able to support themselves without the help of parents until they are between the ages of 25 and 27. In addition, only 59 percent of teens feel confident that they will be able to support themselves between the ages of 18 and 24. Some of this pessimism about future financial independence is a natural reaction to the relatively high unemployment rate among teens. But teens, with a little judicious help from Mom and Dad, can set themselves up for financial independence down the road. Here are a few things that every teen can do to prepare for financial independence in adulthood. One of the best ways to learn how to handle finances is through financial goal setting. Parents can help teens set realistic financial goals, such as saving up for a coveted iPhone, making a contribution to a college fund, or paying for the class trip. Teens can learn how empowering it is to create a written plan for achieving their financial goals and find ways to earn or save money toward those goals. One of the biggest stumbling blocks in achieving financial independence is ignorance of where the money goes. Without financial awareness, it's very easy to spend your way through a great deal of money without ever realizing how much is slipping through your fingers. 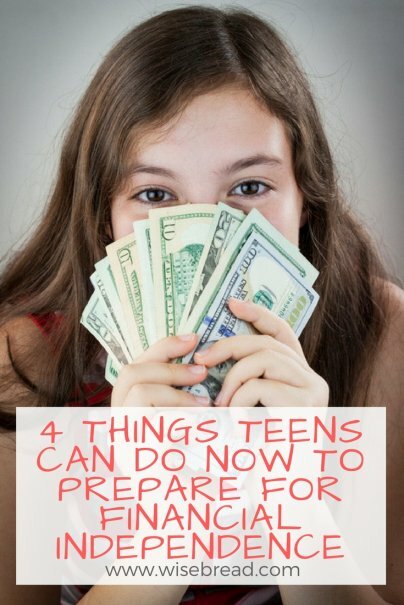 This is why it's important for teens to learn the habit of tracking their finances now. There are several ways that parents can help to encourage their teens to track their spending. Make your teen's allowance conditional on tracking. According to former Vice President Nelson Rockefeller, this was how the famously wealthy family handled allowances: "All of us had to keep a record of where our money went. We were required to give 10 percent to charity, save 10 percent, and then account for how we spent or saved the other 80 percent." Make tracking a family affair. It's much easier to encourage your kids to join in on something they already see you do than ask them to start doing something that seems foreign to them. Include them in money tracking and find a way to make a game of it among the family. For instance, you could have a contest to see who can get their weekly or monthly tracking done first — which will have the added benefit of encouraging all of you to track your spending as it happens. Let them embrace financial technology. There are a number of apps and computer programs out there that will help your teen track money on the very device they are generally glued to. The best options for teens are systems like Mvelopes and YNAB, which both allow for manual tracking of cash transactions. Not only will manual tracking help get teens in the habit of always tracking their spending, but even young teens who depend solely on cash can use them. Any teen who has earned income — that is, who has earned money from a job — can contribute to a Roth IRA. The contribution limit is $5,500 per year, or the maximum amount the contributor earned from a job — whichever amount is lower. For instance, a teen who earns $2,500 per year flipping hamburgers on weekends can only contribute up to $2,500 into their IRA or Roth IRA. Getting started on a retirement account in your teens can make an enormous difference in your ability to retire. The magic of compound interest has more time to work if you start in your teens. In addition, getting in the habit of paying yourself (and your retirement account) first is an important aspect of achieving financial independence as an adult. Since few teens will be interested in setting aside every single paycheck for a Roth IRA, parents can encourage their teens to put money in the IRA by offering to match anything they set aside. While getting teens into the habit of putting money into retirement accounts is incredibly important, it's also vital for them to feel comfortable with investing in general. This will not only help them make smart decisions with the investments in their retirement accounts, but it is also an important way to build wealth. There are several ways to help your teens get involved in investing. Encourage them to buy individual stocks that they find interesting. The stock market offers teens a chance to own a piece of the companies whose products they use every day. This makes investing feel more personal, and gives teens the opportunity to learn how their favorite brands are faring. Ask them to defend their purchases before they make them. Financial professional Lawrence Sprung told U.S. News & World Report that he asked his 11-year-old son to defend his request to buy a particular stock. The article explains: "When his 11-year-old son declared that he wanted to invest in Walt Disney Co, Sprung asked him to prove his case. His son noted how Disney was unrolling a new Star Wars enterprise, enlarging and redeveloping some of its parks, and that people from all over the world would head to Disney's parks whether the economy was good or bad." Create a teen-run family investment account to help your kids understand the importance of diversifying. Hold regular meetings to discuss how the holdings are doing and go over investment strategies. This will help teens feel perfectly at home with the ins and outs of investing. Teens can do a great deal to prepare for financial independence while still under their parents' roof. By getting into the habit of good money management — including setting goals, tracking spending, saving for the future, and investing — teens can be sure that they will reach financial independence and avoid the possibility of living in Mom's basement.